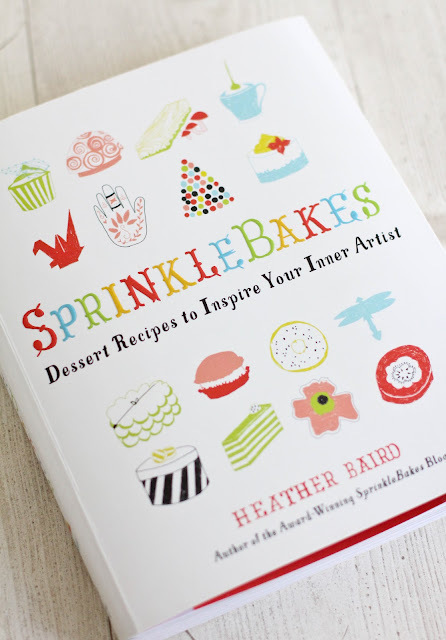 I can’t tell you how excited I am to have been given the opportunity to review the Sprinkle Bakes cookbook, by Heather Baird. I’ll admit right of the bat that I’m a tad biased. Not because of the review copy I was sent, but because I am a huge fan of Heather’s blog. The first recipe I ever saw of here’s was this Flaming Strawberry Cupcake. I was so taken aback by it’s beauty and drama, that I was rendered speechless for a couple of minutes! I’ve been a fan of the blog since, and am thrilled to own the cookbook. The book starts with the simple and moves on to the more elaborate. Before it starts with the recipes, there is an explanation of various tools and techniques that are used throughout the book. It then moves on to basic recipes that are incorporated into the other recipes in the book, such as simple sugar cookies, meringues, and cakes. The book then moves on to more elaborate, and absolutely beautiful treats that really do, as the title implies, bring out the artist within you. This book is full of beautiful and eye catching photography, both of the end result, and more importantly, the step by step preparations. This is more than a book of recipes, it’s a book of guides to creating edible art. Many of the steps are intricate and involved, but the directions are very clear, and the pictures really guide you along. Heather was a traditional artist, creating art on canvas, before she moved on to creating edible (and delicious!) art. I love that this cookbook has categories for various forms and styles of art. There is a section about color, a section about lines, a section about sculpture, etc. It may sound like an art book, not a cookbook, but really, this is a seamless combination of the two. Postcard Cookies (these are so gorgeous and have unlimited possibilities! Salted caramel cupcakes: these are a million levels of deliciousness! Southern Bombe: this is gorgeous in a totally edible and inviting way, which is so unusual for a dessert. Diagonal chocolate mousse cups: because Heather is the kind of person who can make chocolate mousse ten times more elegant! Tuile Cookie Spoons with Peanut Butter Mousse: How brilliant is it to serve mousse on an edible spoon? This cookbook is an excellent choice for anyone who enjoys being creative, and has occasions when they want or need something breathtakingly beautiful, and showy. This cookbook isn’t for someone who is looking for a bunch of quick and easy, every day type desserts. This is an amazing and inspiring cookbook for anyone who enjoys making elaborate and beautiful desserts. Disclaimer: I was provided with a copy of this cookbook to review. My opinions are entirely my own. 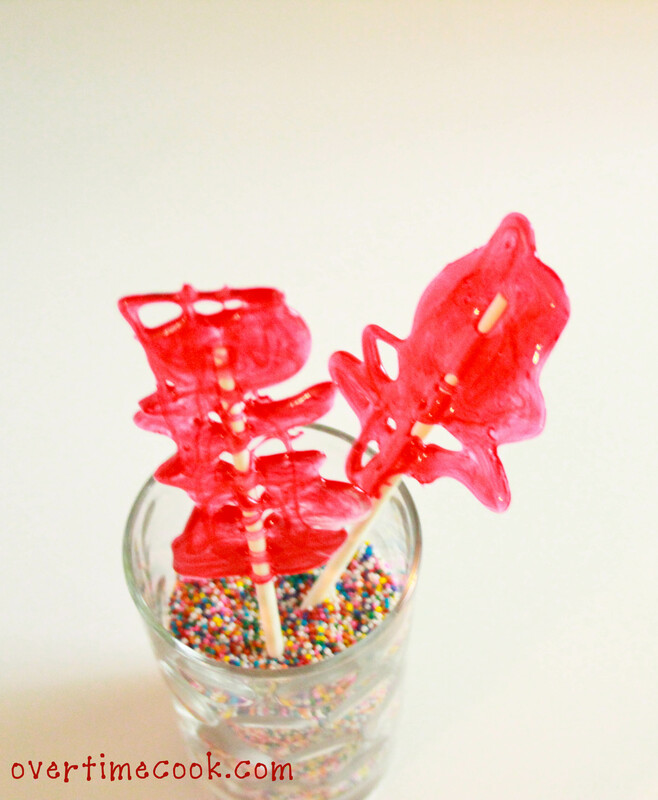 Because ever kid knows, the only thing more awesome than eating a lollipop, is eating one that was homemade for you! Adapted from Sprinkle Bakes by Heather Baird. Note: this requires a candy (sugar) thermometer, which may scare you, but it’s a fairly inexpensive item, and totally worth it! Line 2 cookie sheets with parchment paper and grease with cooking spray. Lay 8-10 lollipop sticks on each tray, leaving enough space between them for the candies themselves. Set aside. In a small saucepan, stir together the sugar, corn syrup and water. Place the pan on a high flame, and clip the candy thermometer to the side of it. Continue to heat the mixture without stirring until it reaches the hard-crack stage, 302 degrees. Do not stop before or after that temperature. Stir the flavoring oil into the mixture. Stand back as this will cause it to bubble and sputter. Place the mixture in a glass measuring cup. If using multiple colors, divide the mixture between two or more cups. Add a few drops of food coloring to the cup, and stir once or twice with the skewer. Do not stir too much, as you want the candy to have a marbleized color quality. 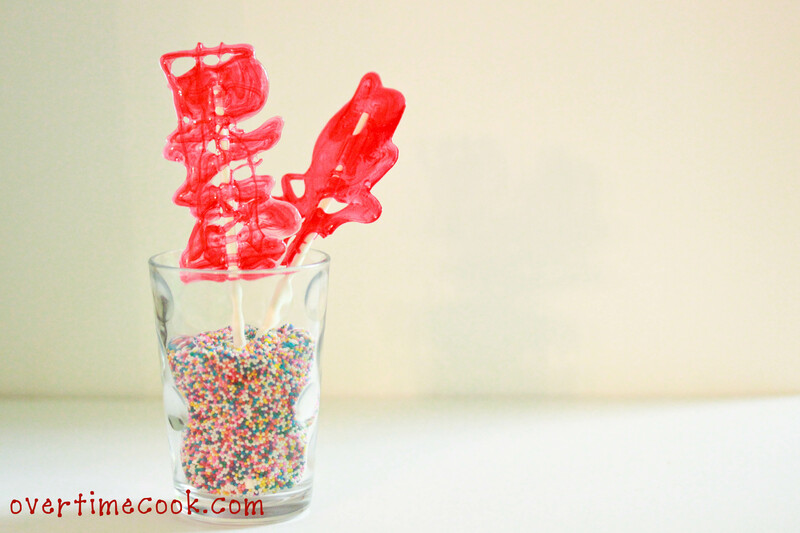 Drizzle the candy mixture over the lollipop sticks. Move the spoon around to get an interesting shape. 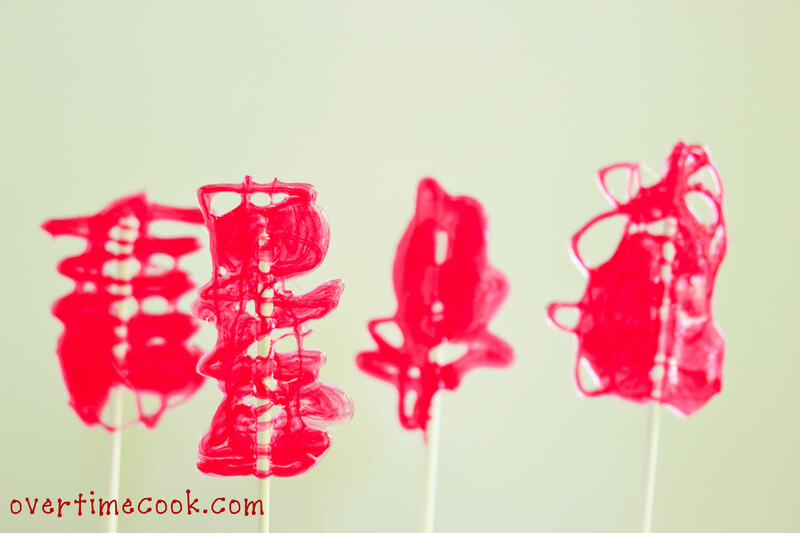 Let the candy fall randomly and watch the pretty patterns that emerge. Work very quickly, as the candy starts to harden pretty fast. Leave the candy to harden, then slide it off of the parchment paper and wrap in cellophane bags. Note from the book about the shapes: There is a concept in art of negative space, that it can add to art in the same way the positive spaces do. The areas around the candy, holes and such, add a nice and artistic touch to the end result. Glad Sprinkle Bakes had you overcome your fear of making homemade candy! This was a very good and honest review of Heather’s book. Hope you find your wafer paper and continue to post your creations inspired by her book. These are so cute! I love that you served them in a glass filled with sprinkles. Can’t wait to check out Heather’s book!